My sweet Ava, pictured here at three months old (now eight months old, 75 pounds and still growing!). We bought her from a breeder at only five weeks old. Being right around Thanksgiving, I lovingly called her "my little butterball turkey" as she was just a little white ball of fur. I named her "Ava" because the name means "strength" and "life" in German, and at the time we got Ava, I was grieving the loss of a white GSD we adopted, named Phoenix age 9, from our local shelter, who sadly passed away after only six weeks from adopting him due to the severe medical neglect and abuse from his previous owner. Ava gave me the strength to move forward from losing Phoenix and very quickly became my best friend. Ava spends her time swimming, playing with our black lab and being my sidekick while running errands. She is very intelligent and gives unconditional love everyday. I am a GSD lover for life and promote this captivating, loving and extremely loyal breed everywhere I go! Hi,Michelle. Thanks to you for taking the time to come by here and sharing your gorgeous white German Shepherd puppies story with us all today. Love the picture - she looks soooooo inquisitive. And I'm sure she's been a great a great German Shepherd for you too. If you ever have more time please come back and tell us some more of what has been going on all the time in between that picture and now. Give AVA a big hug. She is a little star. I have my bold lad...Zeus. 5 1/2 and he is beautiful. I know I will see them again at the Rainbow Bridge. 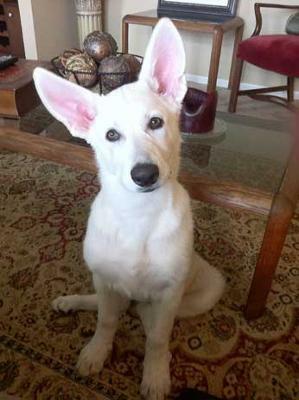 What a beautiful White GSD, Ava! Enjoy each other, love and protect her and she will do the same to you. She is your Angel. Take care. Ava is so lucky to have such good parents!